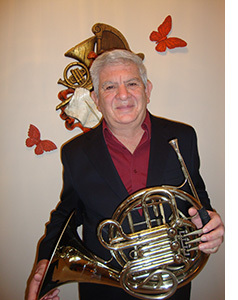 Joel Lopez began his French horn training in the tradition-rich band program of Brownsville High School in Brownsville, Texas. Upon graduation from high school he attended Del Mar Junior College before finishing his Bachelor's degree in Music Education at Lamar University. He received his Master's degree from Southwest Texas State University with a performance concentration. He performed as solo hornist for the Fifth Army Band at Fort Sam Houston. Joel has also performed with the Castle Hills Baptist Church Orchestra; with the San Antonio Symphony, on an on-call basis; and with the George Winters Chamber Orchestra. He continues to freelance in the San Antonio and surrounding area.